The early 1900s was an era when live theatre was the prime form of entertainment in Winnipeg. A time when for thirty-five cents you could see an eight act vaudeville show including a silent movie, a skit, a novelty act, a song and dance routine, a comedy act, an animal act and a re-creation of some newsworthy event like the sinking of the Titanic. It was an era when all the greats toured, appearing live city to city. A time when the vaudeville circuits flourished and Winnipeg was the centre of it all, probably the most important theatrical city in North America. Why Winnipeg you ask? Well the answer is quite simple. The great vaudeville circuits of North America were divided into two distinct groups, those who operated East of the Mississippi River and those who operated West of the Mississippi River. The Kieth, Schubert, and Loew theatre chains dominated the East while the Orpheum, Radio and Pantages chains dominated the West. Alexander Pantages, builder of Winnipeg’s Pantages Playhouse Theatre in 1914, is quoted as saying “all my acts originate in Winnipeg and move around the circuit.” If an act died in Winnipeg it didn’t go on the road. The majority of the vaudeville acts would make the transition from the Circuits of the Eastern United States to the West at Minneapolis, taking the Burlington Northern into Winnipeg to play the big time. Great acts have played our fair city, some long before they became famous, for example, Spencer Tracy had a bit part in a play titled, Right is Right at the Pantages January 19th, 20 and 21, 1924. Stan Laurel played the Pantages several years before he teamed with Oliver Hardy, and Buster Keaton appeared three times on the Pantages Circuit with his mother and father billed as the Fabulous Keatons 1916, 1917, and 1919. Better yet, some of the great stories of theatre today had their origins in Winnipeg. Mr. Bob Hope in his autobiography My Love Affair With Golf acknowledges that he learned to play golf in Winnipeg while appearing at the Walker Theatre with a juggling act called the Diamond Brothers. While on the David Letterman Show about a year ago, Bob went into great detail about his first contact with golf in Winnipeg. Another famous theatrical story deals with how Groucho Marx ran into Charlie Chaplin, a story which takes place in Winnipeg. As it goes the Marx Brothers were travelling from Minneapolis to Edmonton (changing circuits) and had a three hour stopover. Groucho got off the train at the C.N. Station, walked up Main Street to the Empress Theatre where he is quoted as saying, “I’ve never heard an audience laugh so forcefully in my life.” Groucho went in and there for the first time he saw Charlie Chaplin. Groucho went back stage after the show, introduced himself to Charlie and the following year 1922 they toured North America together on the same bill. Winnipeg saw it all, George Jessel, Al Jolson, Will Rogers, Paul Robeson, Laurence Olivier, Sophy Tucker, Harry Houdini, Jimmy Durante, Jack Benny, Bob Hope, Burns and Allan, Buster Keaton and so many more. All the greats played Winnipeg. Of the great vaudeville theatres of the early 1900s there are only three dramatic theatres and one movie theatre left standing. The Pantages Playhouse, originally the ninth theatre built in the Pantages chain of eighty-six theatres; the Odeon, formerly the Walker, home of the biggest names of the day; the Capital, which used to have such a grand staircase off Main Street, the overhead passageway to which is still in existence in the lane adjacent to the current entrance; and the Metropolitan Theatre, formerly the Allan Theatre, which has always been a movie theatre. The Pantages Playhouse Theatre is of course the only original vaudeville house still operating as a live performance venue. The City of Winnipeg is committed to its restoration and revitalization as not only an historic structure but as a vital and important cog to the city’s cultural and artistic community. Q: Do you know where the phrase “You’re in the lime light” comes from? Q: In the ‘30s, ‘40s and ‘50s RKO Studios was one of the largest film studios. What does RKO stand for? 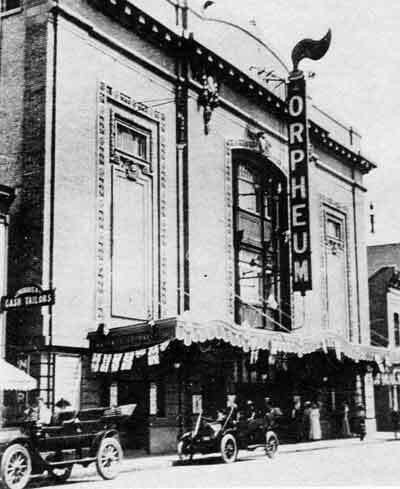 A: The Vaudeville Circuits that merged to form the movie company were Radio, Kieth and Orpheum. Q: What happened to the Pantages Circuit and its eighty-six theatres? A: Alexander Pantages sold the chain for twenty-three million dollars two months before the stock market crash of 1929. The buyer of the chain was Paramount Pictures. 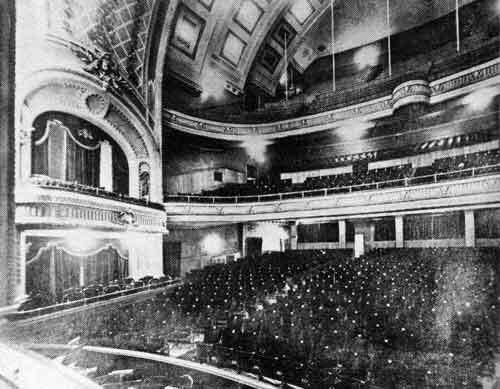 Interior of the Walker Theatre, Winnipeg, 1907.